Sarah Schmalbruch / INSIDERSpeculoos should be in everyone’s kitchen. 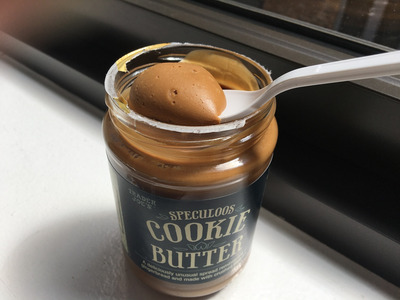 Out of all the great products that Trader Joe’s sells, Speculoos Cookie Butter is the most popular, according to the store’s annual customer choice awards. For those out there unfortunate enough to not know what cookie butter is, there’s a lot to learn. Keep scrolling to see why shoppers worship this spread. It’s basically a cookie, but in spreadable form. 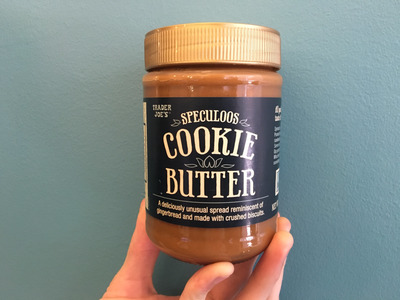 Cookie butter is made from Speculoos cookies, which are crunchy, shortbread spice biscuits from the Netherlands and Belgium that taste faintly like gingerbread. These biscuits are ground up and then mixed with vegetable oils to produce a spread that has a consistency similar to peanut butter. Who wouldn’t want to spoon their cookies out of a jar? It’s not horrible for you. Considering the above point, it’s a wonder that cookie butter isn’t loaded with sugar and fat. There are only 90 calories in one serving (a tablespoon), six grams of fat, and only five grams of sugar. The only real downside is that unlike peanut butter, cookie butter offers virtually no protein. Chances are you aren’t eating cookie butter for the protein though, so we’ll let that slide. It doesn’t need to be refrigerated. Great news, you can keep a jar of cookie butter at your desk in case you need a midday pick-me-up, because the spread doesn’t need to be kept cold. There’s no mixing or stirring required either; it will be the same consistency every time you enjoy it. And the spread stays good for about a year. Sarah Schmalbruch / INSIDERIdeal for spooning from the jar into your mouth. At $3.69 per jar, cookie butter isn’t going to break your bank. You’ll definitely pay more for a jar of organic peanut butter. It’s a great dip for both sweet and savoury snacks. It’s an ideal way to top meals or desserts.